In the year 2000, in a war barely noticed outside Yugoslavia, the indicted war criminal Slobodan Milosevic fought to hold power. He controlled a battle-hardened army, a tough police force, and most of the news media. But he underestimated his opponents, led by a student movement called Otpor! (‘resistance’), who attacked the regime with ridicule, rock music, and a willingness to be arrested. Their courage and audacity inspired others to overcome their fear and join the fight. Otpor! students were the shock troops in what became an army of human rights and pro-democracy activists who systematically undermined police and army loyalty to Milosevic and forced him to call early elections. When Milosevic refused to accept his defeat at the polls, the people responded with a general strike. As normal life ground to a halt, Serbs by the hundreds of thousands descended on the capital on October 5 to seize the parliament in a dramatic triumph for democracy. Milosevic was arrested and extradited to the Hague to stand trial for crimes against humanity in June 2001. Note: The film on this page includes a minor alteration (from the original version) that directs viewers to the International Center on Nonviolent Conflict website. A 13-page Discussion Guide is available as a free downloadable PDF file. Designed for use by informal groups as well as in classroom settings, the Discussion Guide contains background information, topics for discussion, activities, research topics, and a list of resources. You can find more educational resources on civil resistance in Burmese and over 65 languages in our Resource Library. Many of these are available for free download. A Force More Powerful: Emmy-nominated documentary exploring nonviolent resistance campaigns in India, South Africa, Poland, Denmark, Chile and the U.S. 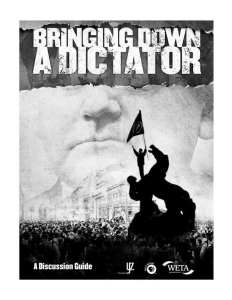 Bringing Down a Dictator: Award-winning documentary chronicling the student-led Optor! Movement that led to the ouster of Serbian dictator Slobodan Milosevic. Orange Revolution: The 17 days of nonviolent resistance by the people of Ukraine against their chronically corrupt government. Confronting the Truth: Examining the dynamics and mechanics of Truth and Reconciliation Commissions in South Africa, Peru, East Timor and Morocco. Egypt: Revolution Interrupted? : Recounting the 2011 Egyptian revolution and its aftermath.